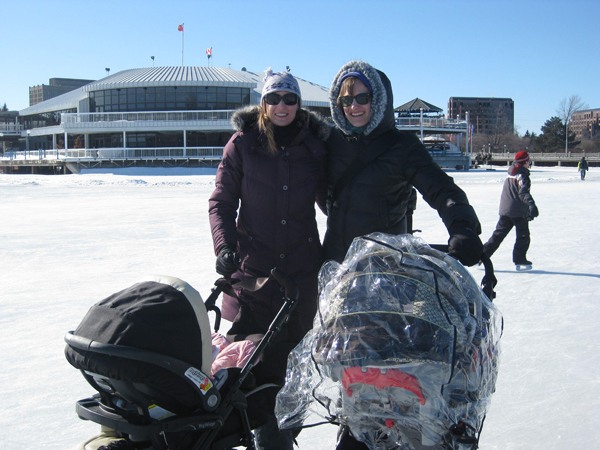 And with a simple toe pique on the baby stroller brake we were off, skating smoothly along on the freshly groomed Rideau Canal ice: Niko, Lena, Heather and I, and Niko getting his first official taste of Ottawa’s Winterlude festival. 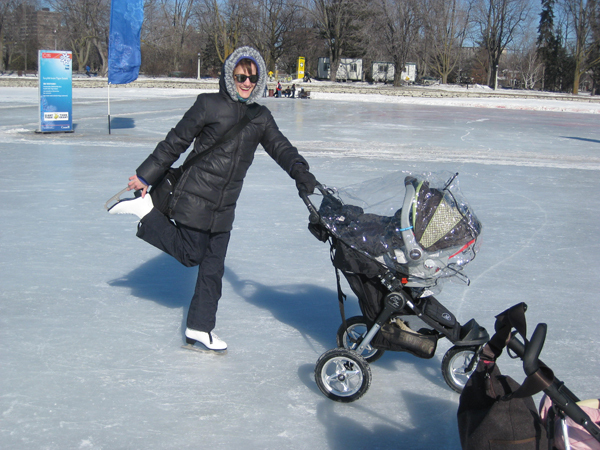 Well, simple to press the stroller break and start rolling, but the whole process of getting baby N from our condo to the Rideau Canal was, simply put, the opposite of simple! Let’s see… What was accomplished before that final toe pique? Niko was fed, I made sure he had a clean diaper, he was adequately bundled for winter, then tears and all, was strapped into his car seat, then into the car, we drove across town (which by this time, and in part due to the magic effect of the car, Niko was asleep), we parked at Dows Lake, heaved the stroller out of the trunk, got myself dressed for winter, clicked the car seat into the stroller, got the diaper bag? check, strapped it over one shoulder, and my ice skates over another, then proceeded to stroll across a busy intersection, met up with Heather and Lena, then, our entourage complete, strolled into the winter hut, got the skates on, and phewf we were SIMPLY off! Yay, it’s a bit of a process – and not really a simple one! – but well worth it! We skated about 4 km in all and then Heather and I treated ourselves to beer and nachos at Mexicali Rosa’s while our babies were TKO! Yes, believe it or not, they both slept the whole time we were in the restaurant! But we weren’t surprised by their excellent behaviour, I mean we do have the sweetest of little angels, right!? And no wipeouts! Just one close call, that’s all!